12th November, Dr. Salim Ali's birth anniversary, is celebrated as Birdwatchers' Day. Happy birding, folks! 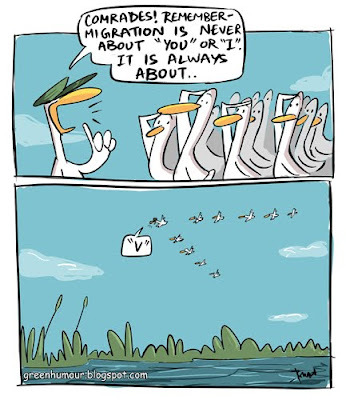 Birds adopt several energy efficient measures to reduce fatigue during their migratory journeys. The characteristic V-formation of migratory geese in one such example. The birds flying at the tips of the V and in front are rotated periodically to distribute flight fatigue equally among the flock. 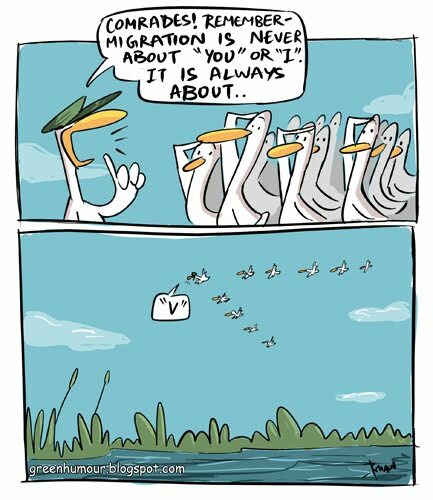 The V-formation has been proven to greatly increase the efficiency and range for long-range migrants, and has even been adapted by military aircraft and airshow flights. he he, this is brilliant!